Louise Erdrich's novel, The Round House, won the National Book Award for Fiction in 2012, and her novel, LaRose, won the National Book Critics Circle Award in 2017. 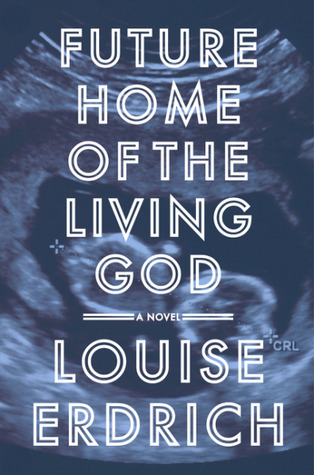 I listened to LaRose (my review at the link) on audio last year and loved it, so I was eager to listen to her latest novel, Future Home of the Living God. Like her earlier fiction, this novel again focuses on characters in the Ojibwe tribe, but this novel is a complete departure from her others, setting its story in a bleak apocalyptic world. Scientists can't explain it, but suddenly, evolution seems to be moving backward, affecting plants, animals, and humans in frightening and unexpected ways. In the midst of this scary new world, Cedar Hawk Songmaker has just found out that she's pregnant. Cedar was adopted by a kind white couple in Minnesota as an infant, though she knows her heritage is Ojibwe. She loves her adoptive parents with all her heart, but now that she will soon be a mother herself, she feels compelled to meet her birth parents and learn more about her culture and family. She drives to the reservation and meets Mary Potts, her birth mother (Cedar was also named Mary Potts at birth). All goes well with their meeting, but things in the outside world are spinning out of control. Babies are being born deformed or stillborn, so pregnant women are being rounded up to "protect" them and their unborn babies. When a kind doctor who does Cedar's ultrasound at the clinic sees that her baby looks healthy, he whispers to her to run and hide. With her adoptive parents missing (somewhere safe, she hopes), Cedar hunkers down to try to keep her baby safe. Outside their home-turned-bunker, things continue to get worse, with a registry of all women of childbearing age, families being torn apart, martial law, and other horror stories. This very unique novel tells two overlapping stories - the story of Cedar and her unborn child and her family (both adoptive and birth) and the story of a dystopian world intent on controlling women. The larger story of the apocalypse is dark and dismal, but Cedar is a remarkable woman who stays strong and hopeful, even after things turn worse for her. The entire book is set up as a diary that Cedar writes to her unborn baby, and the audio book was wonderful, read by Erdrich herself in her beautiful singsong, lightly-accented voice that really sounds like Cedar talking directly to you. I really liked Cedar and both sides of her loving family, and I enjoyed the close-up exploration of Cedar's feelings and actions in not only protecting her unborn child but looking forward to a future better than the present. However, the forces in the larger story are persistent and unyielding. Though I enjoyed the story overall, and found that Erdrich's characters were just as endearing and funny and real as always, the overall tone was a bit bleak for my taste. So far, LaRose is still my favorite of her novels, though I was intrigued by her foray into dystopian fiction. Listen to a sample of the audiobook, read by Louise Erdrich herself. Or you can order Future Home of the Living God from Book Depository, with free shipping worldwide. I like this author a lot so hope to try this one at some point. Nice review Sue. I like her, too, Diane - I still need to read The Round House. I loved LaRose, too, and its counterpoint piece, The Round House. But I am curious about this one, too. Thanks for the honest review. Oh, I didn't realize The Round House and LaRose were related to each other! I still need to read The Round House. I haven't read Louise Erdrich, but I keep meaning to! Oh, you should! I loved LaRose, and The Round House won the National Book Award. It was an excellent book, and I enjoyed it - just wish it had a happier ending!